It’s been 16 days since protests kicked up in Haiti and shut down travel throughout the country. Last weekend, the protests took a break for the weekend and never really kicked back up. The government made an announcement that they would take a few measures to address the issues at the heart of the protest. They announced a desire to subsidize staple foods, and that they would audit the import taxes and make sure they are enforced properly to get the money they need to do so. They also announced that they will investigate the wasted money from the PetroCaribe loans, which was another major rallying cry of the protesters. So the general population is waiting to see what will happen. In my opinion, this is far from resolved. This is a pile of embers after a blazing fire. All it will take is a little more fuel and it will kick right back up, or if it sits long enough, maybe it will fizzle out on its own. Unfortunately, despite these small victories, the protests have kicked off what could be an even more brutal economic collapse. As a result of the protests, many foreign governments have classified Haiti as a “no travel zone”, or in U.S. State Department terms, it is under a level 4 travel advisory, similar to Afghanistan, Iraq, Iran, Sudan, etc. Some may disagree with their assessment, but it is probably fair to say that the only people I would advise to be in Haiti right now are those that are familiar with the culture, politics, and language and are willing to be in a place that has the potential to go into lockdown again with little to no warning. For missions organizations, this means that short term teams won’t be coming. Each organization is different, but here are a few of the results of teams getting cancelled. -Support staff will be laid off. There are no teams to cook for, clean up after, and work with. -Direct funding for projects is down, as a percentage of team fees go to the ministries’ general funds. -Engagement and Awareness will be down. Each person that comes on a trip talks about it on social media and with their friends and helps to get more people aware of, and supporting, their host organization. For at least one ministry I talked to, this will lead to lay-offs of workers, and a near complete halt on any capital projects, such as construction, moving forward. 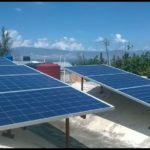 Beyond the fact that ministries may not be able to do what they had hoped to do, this is also a time when many have become aware of new needs for a more sustainable future. Gasoline, Diesel, and even Propane are still in short supply and remain on the edge of running out if the government falls behind in their payments again. One of the major differences in how people fared during this last protest was whether they had any solar power to sustain them through 10+ days of receiving no city power. 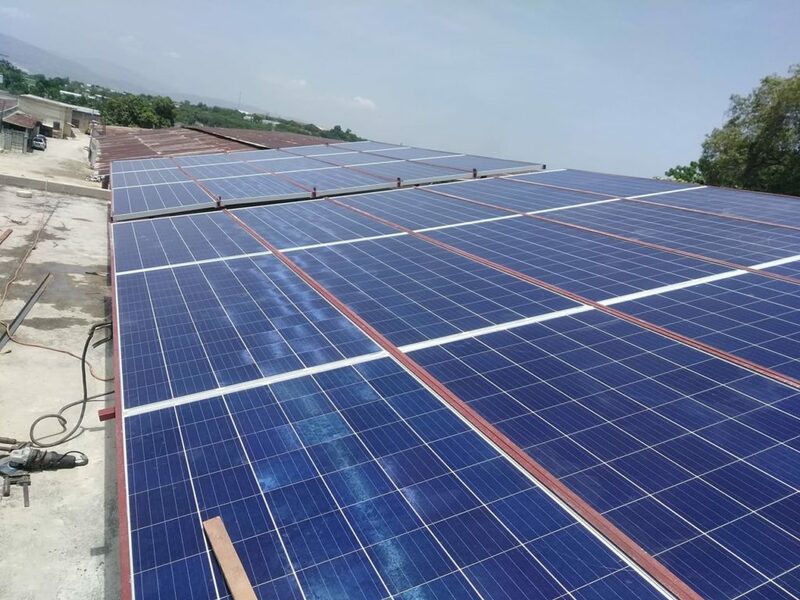 Now is a season for missions to install solar to prepare for continued blackouts in the future, but these are costly investments, especially in a time of economic recession. So, all of this is to say. Pray for Haiti, and support your friends and missionaries in Haiti more than ever. If you had planned to go and can’t, please consider doing a social media campaign to spread awareness and raise support to those who you already care for. Maybe even try consider a fundraiser for them. 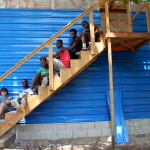 If you have means available, support anyone you know in Haiti financially at this time. While there are corruption and heart issues at the core of the current problems, it is most manifested as an economic crisis, so money is at the heart of most ways to help right now. If you have friends in Haiti, check in with them. Pray for them. Ask good questions about how they are doing and find ways to help them in their struggles. Heck, if you want to help the economy and them, you could even offer to send them to a couple nights at a local hotel, where they can relax while still benefiting the local economy. 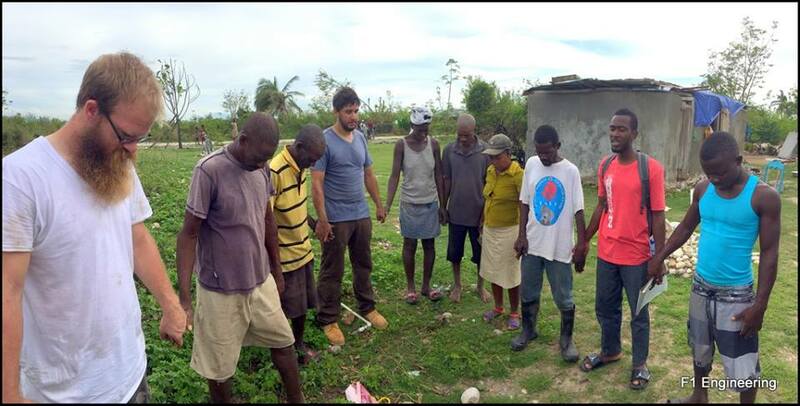 Above all, pray for Haiti, and for those you hold dear that are still there. These protests kicked off a chain of events that will results in short term struggles. If things work out well, this could be a revolutionary even in Haiti and it could usher in a much better period for Haiti, but it will not come without short term struggle. Also, pray for wisdom for those of us who are out of Haiti at the moment. It is hard to be away from home, and we are seeking wisdom for when it is best to return. For us personally, we will take every opportunity while we are the in states to spread awareness and prepare well for our return, which we are hoping will be in March. Today I want to focus on a topic that we don’t often discuss on the F1 site, health and safety. Haiti’s healthcare situation is rather rough. The hospitals exist, but often times lack equipment, organization, power, and even proper staffing. As a result, Jamie and I have helped patch up our crew multiple times after moto accidents, which are the most common injury we see. Unfortunately, sometimes it is beyond our ability to do anything. So, in those cases, we offer financial support for our guys to go see a doctor. Sadly, we can’t even trust this outcome either. Right now, Waly and Anderson are dealing with lingering issues from moto accidents. 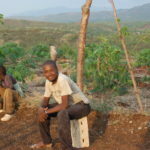 Waly’s accident was in November, and his wrist is still causing him pain. Ander’s accident was the whole way back in July. Both of them went to the hospital and received treatment, and I thought the would be properly checked out and healing. Waly’s moto after he hit a tree that had been laid in the road at night. We’re thankful that his wrist was the only damage, and that Jonas escaped uninjured as the passenger. Then, a few weeks ago, they both went to get x-rays since their bodies were still being so slow to recover. 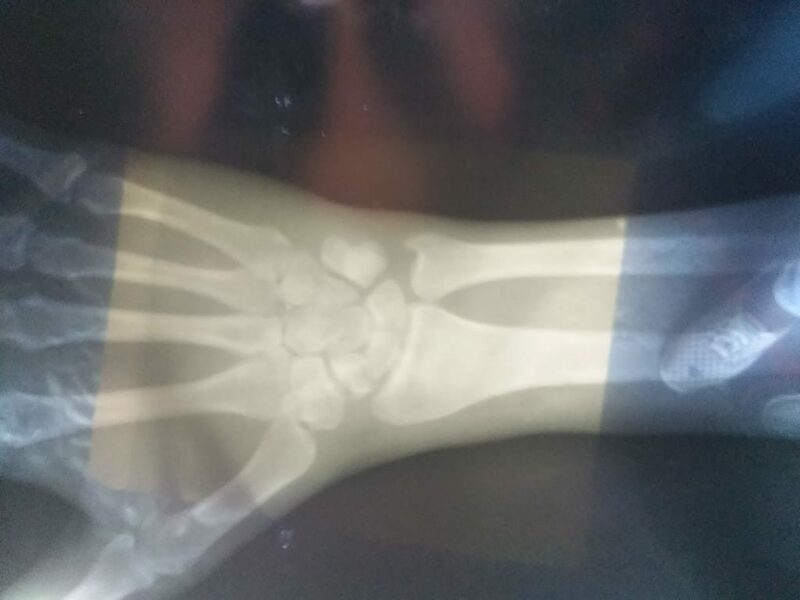 For Waly, I can’t tell much, because I don’t know what a hand/wrist x-ray should look like. However, when I saw this picture of Ander’s foot, I knew we needed to find a course of action. Please pray for us as we have an orthopedic consult with CCH on tomorrow (Sunday) for both of these guys. There is a team of orthopedic surgeon’s visiting this week, but they may already have their schedule’s booked up tight so I’m not sure what the consultation will yield. At least we will get some answers on the next step forward. 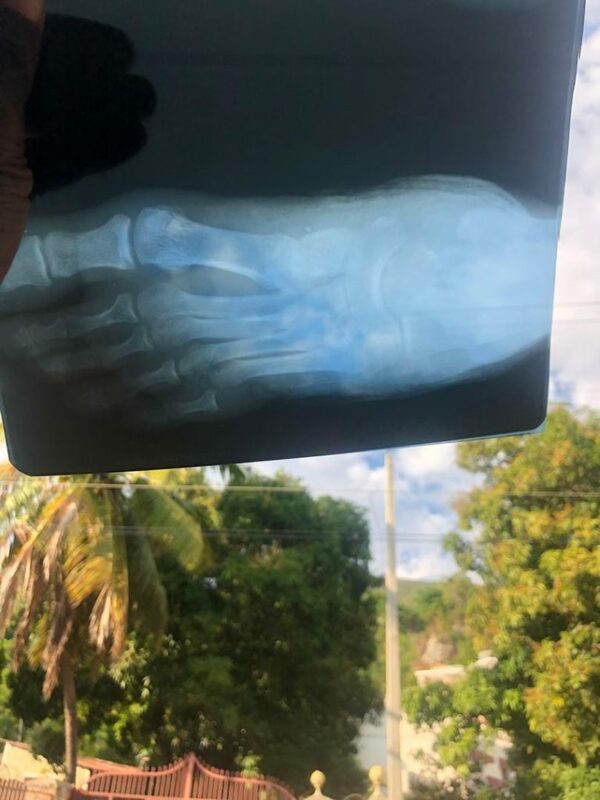 If CCH can’t do it, surgery would likely be in the thousands of dollars for Anderson, so I don’t know how it would get paid for, but I am sure his foot needs some work. Also, please keep my mom in your prayers, as she had another surgery this past week. It was a followup on last year’s major surgery to remove thyroid cancer. She is in good spirits and anxiously awaiting her release from the hospital. P.S. CCH stand for Community Coalition for Haiti, a non-profit based out of Northern Virginia which has a clinic and surgery center here in Jacmel. They offer physical therapy services year round and bring in surgical teams periodically for these kinds of issues. My resolution for 2019 is to write more updates, so I’ll start today. However, I think one of the hardest things for me to encapsulate in a blog post is the complexity of life here. As such, I’m going to try to stick to single-topic posts rather than giving a complete update each time. Today’s topic is the logistical nightmare hanging over the entire country this year, our Fuel Supply. and bought us enough fuel to last a couple days, as that’s how long a typical shortage lasts. companies couldn’t keep their towers running without generators, and it meant that people and goods couldn’t get around the country as needed. Within a week, they worked out a deal to get those 3 ships unloaded, but the issue remains unresolved. policy, and now we see that this lack of money has led to a lack of fuel all around. does not work transparently, we will not have any indications that this will be happening until it hits. populace would respond well to their decisions. 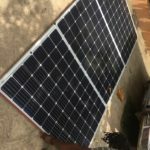 For us, we have purchased some more solar panels, and plan to purchase more batteries when we get some more money, in an attempt to reduce our dependence on fuel. generator to provide A/C a couple hours each night that EDH (city power) doesn’t show up, which is typically every other night. functional as of this morning. We need help, so please pray for us, that God would meet our needs however He sees fit. This last 2 months has been crazy busy. It’s been good, but I am becoming more and more aware of our need for help every day. Many days, I feel overwhelmed. Pray that God would continue to sustain us, as He has been doing for so long, and that we would keep our eyes on Him. The busyness comes in many forms, with much of our energy going into our continual “survival”, including taking care of the kids, keeping up with maintenance of the house, workshop, and vehicles, and making sure we have basic things like power running and food in the pantry and time to cook it. Beyond that, our requests for help continue to roll in. Each week, we are given the opportunity to help multiple other missions in Haiti, and sometimes we even have to turn them down. But that adds stress on my because I realized that there is no one else for me to recommend them to complete their work/ fix their problems. 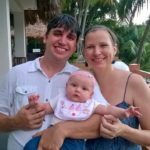 We are looking forward to possibilities for the future, including the fact that we may have more missionaries coming to help us for longer trips, but this is also a time that I am starting to realize our need to host a few short term trips, and possibly recruit some people to work with us from the U.S. as well. We were glad to welcome a girl named Anna come to visit us a few weeks ago, and she expressed an interest in continuing to work with F1 Engineering, possibly for a couple months, as we figure out a project where our needs and her skill intersect well. The following week, we were supposed to be visited by Matt and Christina Smith. This was a long-awaited trip to introduce Christina to our town and country. However, the plans had to be postponed indefinitely at the last minute when their children were passing around a stomach bug. This was a tripping point for me to realize that we need more help, and I just kept holding out, thinking that they would be here soon and all would be fixed. But the truth is that they still have a big journey before they would make it here, and we are almost drowning as it is. F1 Engineering has grown beyond what I could have dreamed up 7 years ago, and it is wonderful to see. But it is also growing beyond my ability to manage it all. Many days, I don’t even get to the workshop to work with the crew because I am too busy with taking care of our family and the never ending emails and administration work to help other ministries down here. So, I have updated our “How to Help” page with practical information about how some of you may be able to get involved. We are looking at the possibility of hosting a couple short term teams in the winter/spring timeframe to do some construction in the shop. And we will be looking for some professional help from mechanics and/or welders to come help us get our shop and vehicles up and running well, and to teach the crew to use and maintain what we have properly. The link at the top of the page works, but here is the text as well, so it will be a part of this post. -Pray for us. We are a bit overwhelmed right now. Pray for strength, peace, and wisdom for Jamie and I. 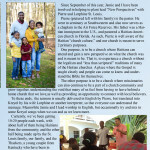 -Pray for the Smith Family, who have been planning to come to Haiti to join F1. They have encountered some difficulties along the way. Pray for discernment for their next step. -Pray for Anna, who visited us, and is seeking if, when, and how she should get involved in this ministry. -Pray for the guys in the shop. They are growing in skill and maturity. Pray for their spiritual growth as well. Many of them have been burned by church and “missionaries” before, so pray specifically that God would get ahold of them, that His Spirit would call them to follow Him. -Pray for wisdom as we start into the projects below, that we would do as God would have us, giving Him the honor each step of the way. A generator project in Johnstown, PA.
We have been donated an Onan 30.0EK-15R generator, but it needs converted from natural gas to propane before we can ship it to Haiti. We have shipping lined up from Alabama, but want to make sure it’s ready before we ship it. This is an urgent need. I have some information about what parts need put on, and it may take someone with some mechanical experience. Please let me know if you can help. -We’re looking to set up F1 Engineering as an independent 501c3. We have been a missions branch of Crucified Church for a long time, but some of our donations, like from Lincoln Electric, can only go to a 501c3 registered organization. -We also need someone who can do data entry into our accounting software. Basically, just take a pile of receipts and enter their information and a scan and/or picture of them into the computer. My dad can continue to handle things after that point, but it would lessen his load significantly as he is overworked right now. -I would love to be able to give the guys business cards. I have the capability to do it, but I don’t have time. If I give information, can someone make up some business cards for Gayly, Waly, and Anderson and I’ll get them printed up. -We are experiencing a great need for a “simple” project. 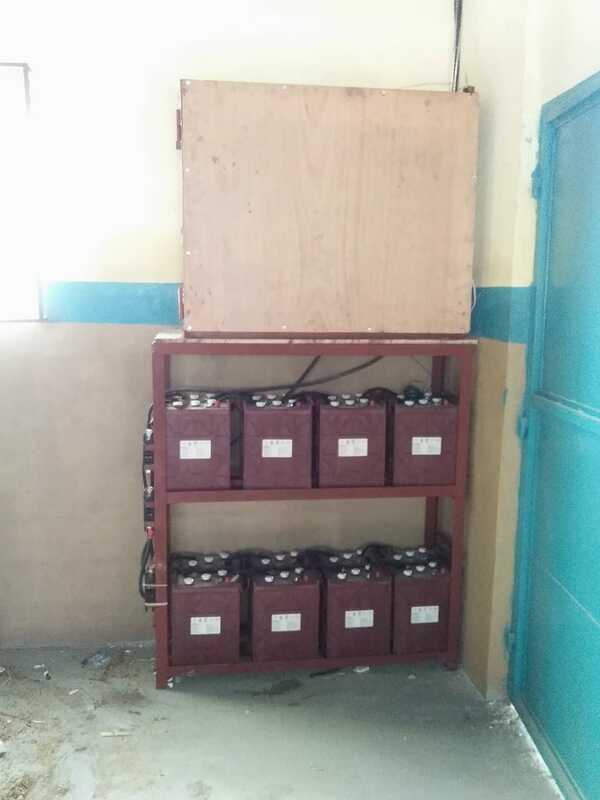 We need to put a current transducer on our battery banks, with a load diversion relay that will trigger automatically when the current into the batteries breaks the maximum threshold. -Another simple project…A system to take 8 battery voltages (nominal 6V) and trigger a warning light if any of the batteries is higher or lower than the average. -Building a data logging system to collect information on our installations to enable better troubleshooting and improve our future designs. -Specifically will need someone to code a microcontroller to gather timestamped signals from ~20-30 inputs and probably a second person who would be in charge of doing the pre-processing of inputs to meet the voltage levels of the onboard ADC’s. -I need someone to help me setup an accounting system, or explain to me some best practices. As of now, I end up with a stack of unorganized receipts that pile up until they look like a 2 ton weight that I can’t deal with. Ideally, it would be nice to be able to track funds on a missions credit card, checking account, paypal account, and shipping account all in a quick view. -Pouring concrete for our driveway. We are starting to gather materials, but could use help in the near-ish future with site prep (leveling, sloping, forming) and the actual concrete work. -Stuck in 2nd(?) gear. Runs fine, but never shifts. -Undiagnosed issue. On first start of the morning, will not idle until after a 1-2 minute period of revving at about 2k. Works fine afterwards. Replaced MAF sensor, but did not fix issue..
-Electrical issue disabled the scanner port. -Framing rafters on our house and putting on sheet metal roofing. Simple purlin style, open gables. Purpose is to shade our concrete roof from the sun to reduce internal temperatures in our house. -Expanding the roof on the workshop to cover our expanded driveway space. Mara is now 2 years and 2 months old, and Aiden is 5 1/2 months. They are such a joy and blessing in our lives. I cannot even begin to put it in to words. We returned to Haiti with both of them at the end of March and have been trying to settle in/keep up with work ever since then. It’s been a struggle at times, if I’m honest, and it is exposing how much more we need to improve on time management and communication within our family, and within our work crew. The crew is doing great. Honestly, one of our biggest challenges since we’ve returned is that Gayly and Waly have been getting more work requests as welders than ever before, so I actually have to verify their schedules before I can plan jobs. It’s a good problem to have, but it is teaching me to plan ahead much better than before. One of our other recent challenges has been vehicles once again, but I think that is trending in a good direction now. Our family car, the Isuzu Trooper, took a few sick days in Port Au Prince about 2 months ago when the front U-joints went out. Since then it has been running as a 2 wheel drive vehicle, but we have the parts and it should be healthy again soon. The work trucks keep trading off which one is running and plugging along, but they both need some work. We anxiously await our “new” 2002 Nissan Frontier 4-door pickup that is finally at the docks in Miami ready to ship into Haiti. It will give us a better people-moving truck, and it also has a bunch of parts to remedy the ailments of the other work trucks. Once it is here, we will likely sell our F150 to recoup some of the shipping costs as well. 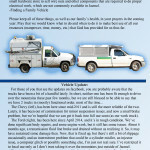 We definitively don’t want to keep running 3 work trucks due to maintenance expenses here. We’re also eager for the truck to arrive for the generators that it holds inside. Our “shop generator” that is used for welding died about a month ago and we have been unable to get parts for it, so we finally had to break down and buy a generator here as well. We got this Daewoo 6000 Watt diesel one 2 weeks ago. All the guys in the shop agreed to pitch in their pay for our big project last week towards this purchase and I’m sure it will help us a lot as we continue our work in the future. Speaking of last week’s project. We were excited to get out 2nd big project in as many months. 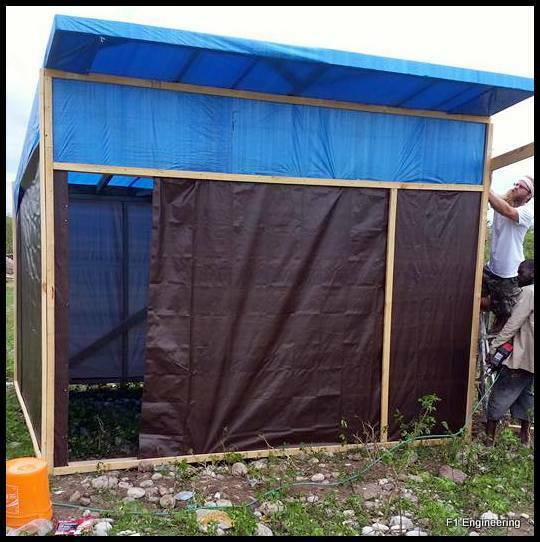 First, we did an installation for Haiti Christian Outreach in Peredo (just outside of Jacmel). 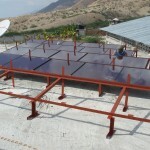 It was (30) 260 Watt solar panels and 7200 Watts of inverters. 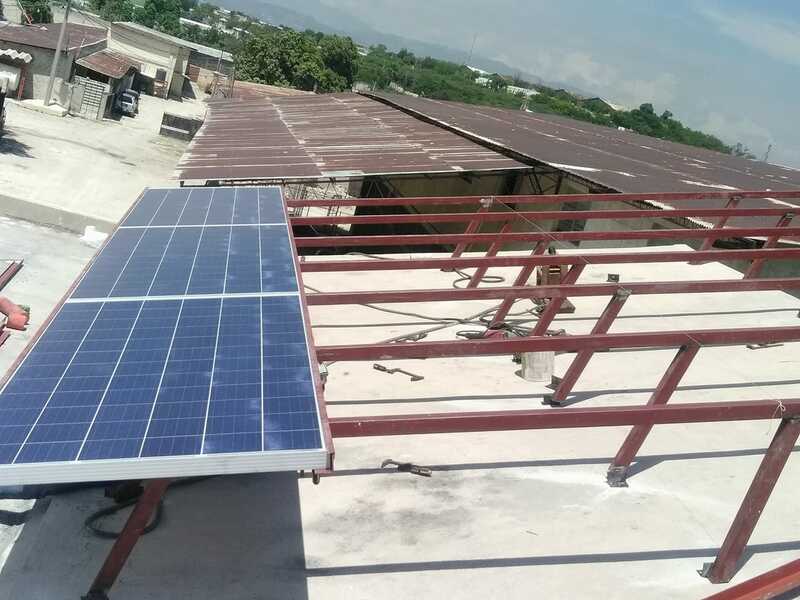 And since that quote was fresh in my head, we were able to turn around and get another project for (30) 315 Watt panels and 10.2 kW of inverters for Deux Mains, a sandal manufacturer in Port Au Prince that is setting up a new factory space this summer. Here are some pictures from the Deux Mains installation. I’m proud that this was probably our prettiest installation to date, with some nice new features like putting air filters around the inverter installation to try to increase their longevity. This was an exciting project, and I am super proud of the guys. They did a great job this week, especially because I was gimping around (or just sitting down) most of the week after taking a fall off the ladder at my house last weekend. Please pray for us Jamie, Mara, Aiden, and I head to PA for 3 weeks to celebrate my mom’s 60th birthday. And pray for those involved in our ministry, including our work crew for their safety, growth, and salvation, as well as the Smith Family and our newer friend Anna who are looking to maybe come join F1 Engineering’s efforts down here. 2017 Year End Newsletter, Looking forward to a better 2018! 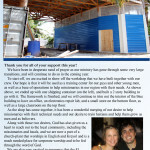 Thank you for all of your support of our ministry in Haiti. This year had more than it’s share of ups and downs. In fact, it was probably the hardest year that I’ve spent in Haiti to date. But, we have learned through it and will be starting 2018 with a fresh perspective and lots of optimism. I know this is a long message, but please read it through, because the gloomy outlook of the first part is my attempt to be honest with all of you, but there is plenty of optimism as we look forward. Most of the reasons that this last year was hard were self-inflicted. 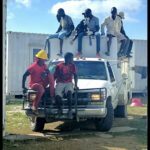 One such difficulty was the painful end to our hurricane relief work. 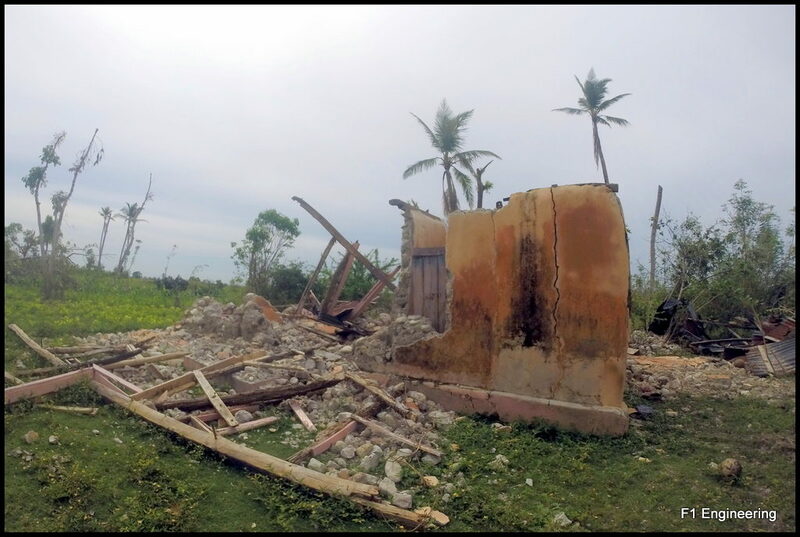 In the fall of 2016, Hurricane Matthew hit Haiti and we began to assist with relief work. That work went well for a couple of months. Our best week by far was the first trip after the hurricane. 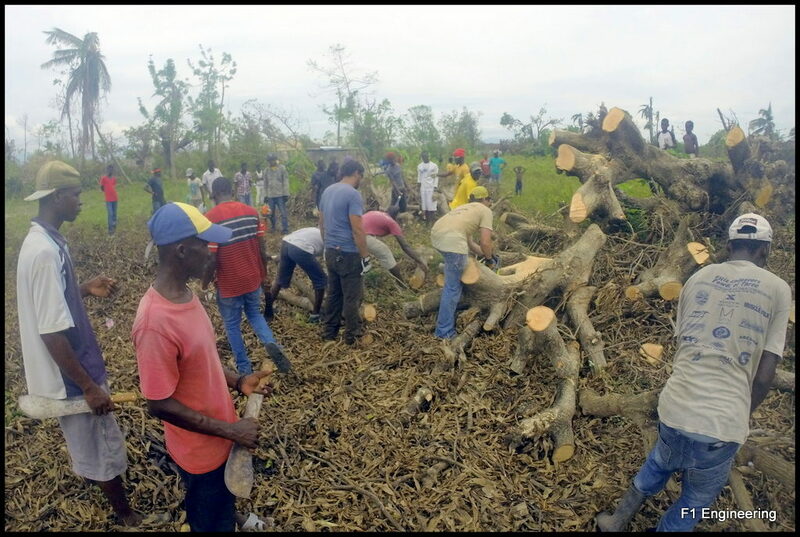 That week, our crew from Jacmel joined me and we simply went around cutting up trees that had fallen wherever there was a need. A crew of locals joined us, but all the work was done on a voluntary basis. Unfortunately, as we took subsequent trips, more and more money was involved, whether it was being used to hire workers or purchase materials. 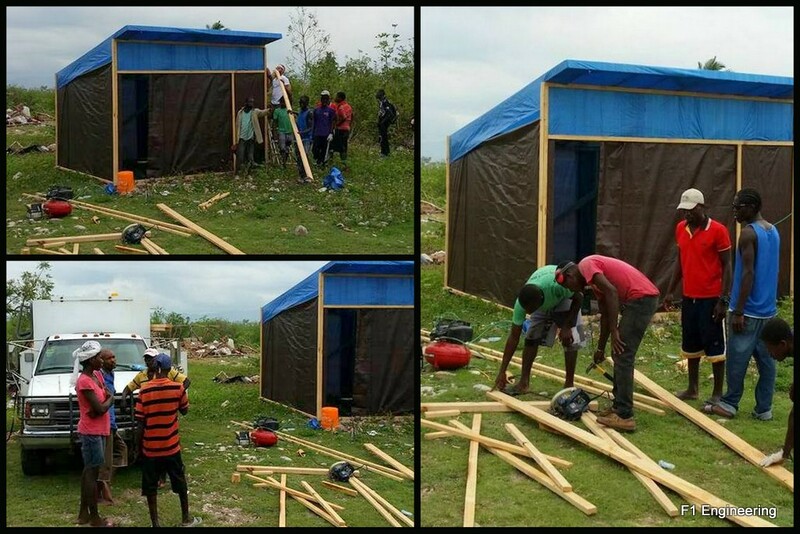 We used this to build a few temporary shelters for families in need, and to hire many, many workers, but this stirred up trouble within the community. I was trying to use every dollar wisely, and we did the best we could. 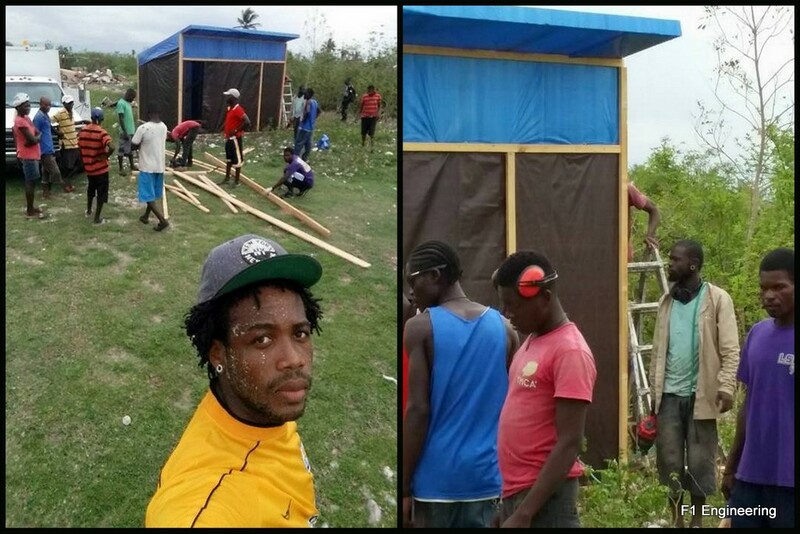 We built multiple houses for families in need, and provided materials for many others. We even were able to provide jobs for over 100 men during our time in the community. However, as we would build a house, the family that was chosen would be excited, but another 20 people would complain that they were not chosen. Even as we chose workers, there were constant complaints about how we were choosing workers. The final straw, however, was when some unhappy members of the community actually blocked the road to prevent us from fixing someone’s house. Honestly, this broke my heart and kept me jaded for quite a bit of 2017. While I still feel that God did want us to help with the relief work, I have learned that we must also continue to wait on Him for guidance in each step of the way. I think I was overwhelmed by the needs and a desire to help, but realized too late that I was not the best man for the job. 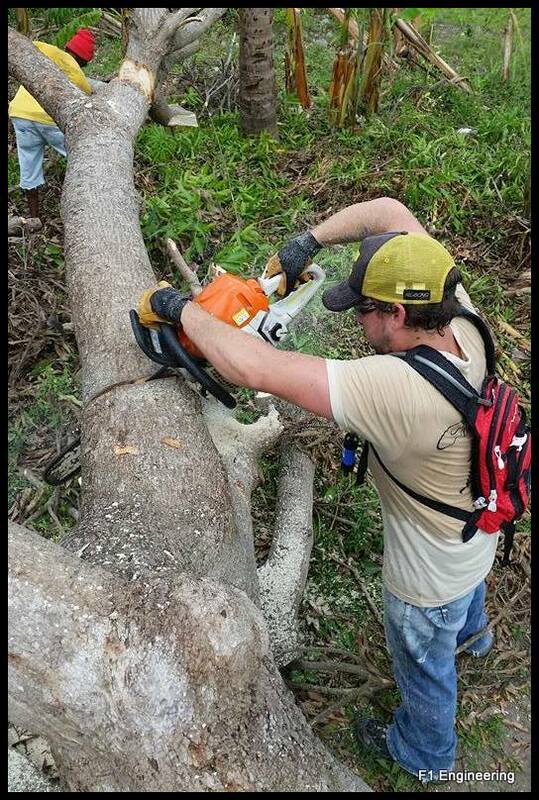 Our most constructive efforts were to hire a trusted local crew to continue working while we were gone. They knew the community well and fixed the houses of those most desperately in need. 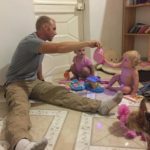 Beyond the hurricane relief work, this past year was trying because I couldn’t seem to keep up with doing our work well and being a dad. Part of it, granted, was that our house and vehicles both required significant maintenance this past year, and some of that is yet to be completed. Between the maintenance work and trying to be there for Jamie and Mara, I frequently got behind in responding to emails or planning work properly. Furthermore, many days the crew of guys at the shop didn’t have any work to do because I hadn’t made any plans for them. All of this was weighing heavily on me, and I was not coping well. Each time I let someone down, I took it personally, and this even took a toll of my spiritual well-being. As I was struggling to find enough time in the day, I sacrificed the most important things, like taking time to read scripture and truly “Be Still” before God in prayer. As you can imagine, this is about the worst possible thing for a missionary to admit, and even to say it now makes me feel like a fraud. However, God was (and is) working in our midst, even in our struggles. So, on a more upbeat note, let me share with you some of the successes of 2017. First, as I mentioned the hurricane relief work. While I don’t think we executed things as well as we could have, we were able to help many people that were in desperate need. Realizing how little our resources could do, I was intentional to pray with each family we surveyed and try to point their eyes towards God as Jehovah-Jireh, our great provider. 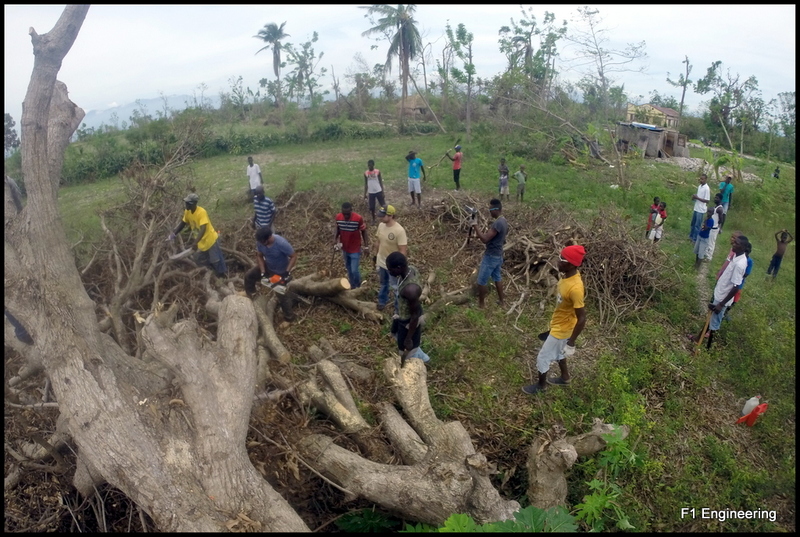 And, in the end, we employed lots of people in need of work and provided help and materials to over 50 families trying to recover from this disaster. 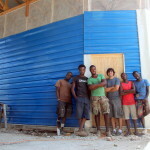 Next, our crew of apprentices has grown tremendously. We have a regular group of 8 guys at this point with Lulu, Waly, Anderson, Kily, Gayly, Fleury, Deny and Chalet (not pictured). Gayly and Waly have developed into foremen in our crew and teach the other guys what they know. They have all grown significantly in skill and maturity this year. 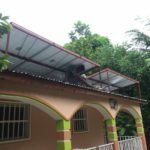 Overall, we were able to complete 16 power system installations for missionaries all over the country in 2017. 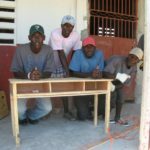 These missionaries ranged from dear friends in Jacmel, like Pastor Pierre and Chase and Kimmey Barbrey, to one of our furthest trips up into the Artibonite to put in a system at the Christian Veterinary Mission’s training center. Possibly even more exciting is that these guys have learned enough that I am able to send them to complete some work on their own and come in for inspections at the end. 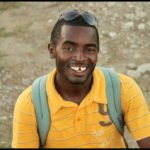 Additionally, Daniel, whom we have sponsored at diesel mechanics school for 3 years graduated this year and is working in Port Au Prince. He also is engaged with hopes to get married soon. Unfortunately, good work is hard to find, so he is currently a driver there. 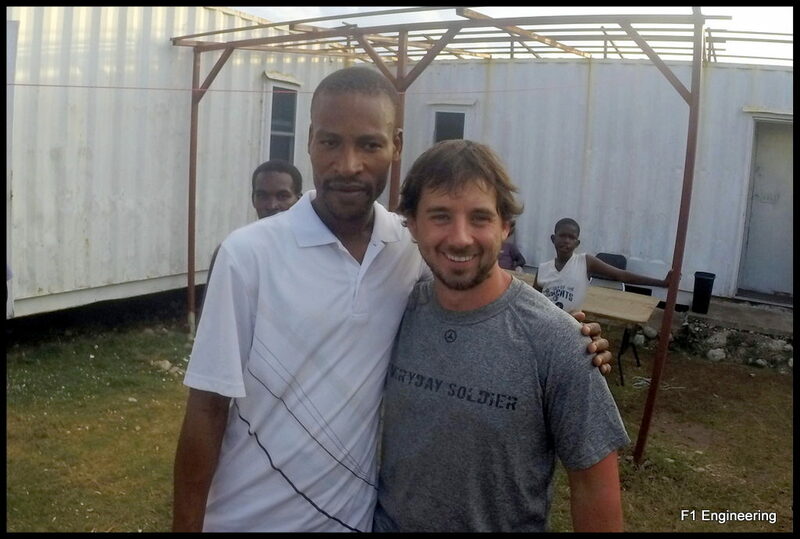 I would love to have him move back to Jacmel and work with us, but until I can give him some sort of fixed income, I won’t be able to do that. 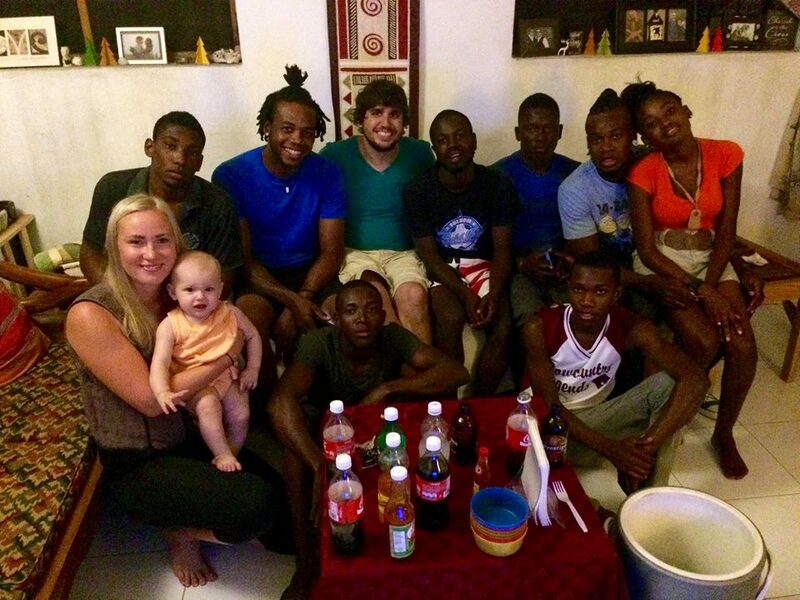 Then, we made some new friends, who we look forward to growing closer to this new year. 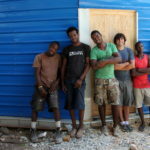 Chase and Kimmey Barbrey moved in to Jacmel last February, and I was able to help them set up their house. 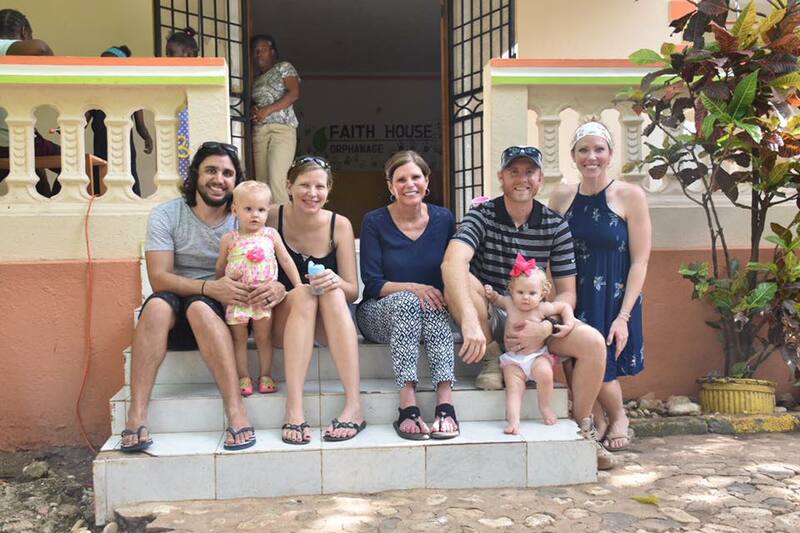 Prior to coming to Haiti, they served for 3 years in Uganda, and they also have a little girl who is about 6 months younger than Mara. They became good friends quickly, and we plan to start some prayer and worship times together in the new year. And finally, our most exciting news of 2017 came to fruition on January 16, 2018 when our son Aiden Olavi Knipple was born. He is a wonderful little man and both he and Jamie are recovering quite well. 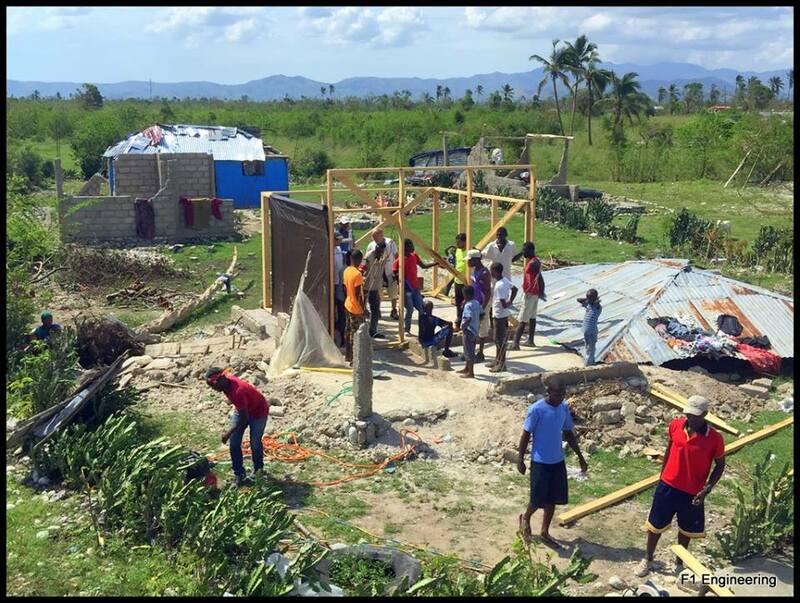 (1) To aid missionaries in Haiti with whatever skills/resources we can so that they may be better equipped to do what God has called them to. (2) To use our work and tools to train up a group of young men in trade skills, maturity, and as men of God. With these stated purposes in mind, we are trying to re-focus our efforts in 2018. In order to start this new year off properly, we are taking the most important steps in our personal spiritual lives. This past year, we got off track on personal disciplines as well as community worship. So, in addition to Jamie and I getting back into our personal times with God, we will be seeking to have a regular time of worship and prayer that will be open to other missionaries in the community. Chase and Kimmey have expressed interest, and others may follow, but we need to do it for ourselves even if no one else can make it. For our work, we will start the year by taking a few steps to improve our organizational administration. One step will be to officially start a “business” in Haiti, so that we are paying payroll taxes and everything as we should be. We will continue to focus our work on helping missionaries with non-profit jobs, but are open to the idea of taking on a few “for profit” jobs throughout the year, if it seems that God would have us to do that. It would certainly help fund more projects, but I do not want to fill our schedule with work that is not what we are meant to be doing. As this new year starts, I will also be focusing more on our work crew. As they have progressed in their skills, I have handed off more and more responsibilities to them. It is a great step that they can do things on their own, but it has also created a situation where their skill level is no longer progressing as it should. Unfortunately, this also extends to their personal maturity, and even more so, their lack of spiritual growth. I must spend more time with them if we hope to make a shift from pure job training into a situation where the guys will come to know Christ and choose to follow Him. This is a big transition that I want to focus on, and it rides mostly on my own personal spiritual discipline and the prayers from all of us that our guys would to come to know and love God as we do. We have received a donation from Lincoln Electric welding company and from J&J Trucks in Somerset of both a Plasma Cutter and a used Welder/Generator. These are great blessings as they will enable us to do even more work in the shop. 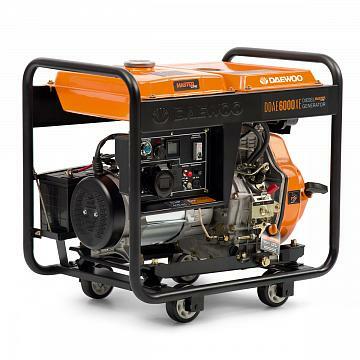 Especially the generator is important as both of our generators currently in Haiti are giving us problems. I have not figured out the shipping arrangements yet, so please pray for wisdom with us on the best way to get these units to Haiti. We also have an exciting partnership as we enter this next year. A few professors and students from Cedarville University, my Alma Mater, are planning to help us develop a power monitoring system that will enhance our installations all over the country so that we can maintain these systems better and expand them as necessary. We want to reduce the chances of maintenance failures causing damage to these systems that are major expenses for most ministries. 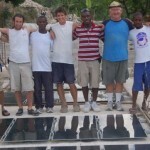 And the most exciting news is that there is a family that wants to come join us in Haiti and work with F1 Engineering. The Smith family, from Lawrence, Kansas, reached out to me in the fall of 2016. Matt Smith is an electrical engineer and he came down to visit us for 2 weeks in January of 2017 and is very excited about being part of what we are doing. With his help, we can ensure that everything we do gets done well, as I know I drop the ball sometimes because I have too many jobs going at once. 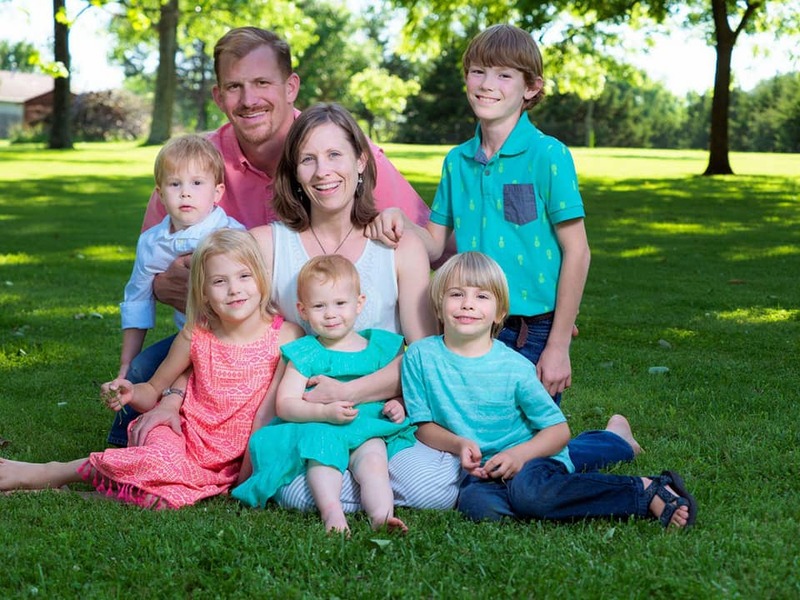 Please pray for Matt, his wife Christina, and their 5 kids as they seek what God would have them do. There are many concerns in moving a large family to the field, but we know that God can do all things if we are faithful to follow Him in both timing and direction. Thank you for your support this past year. We cannot do anything without God, and we truly value your prayers each and every day. As our family and ministry grow, we know there will be more stress, work, and expenses, but also more love, grace, and opportunities to honor God in all that we say and do. Please pray for us that we may remain focused on Him, and that He will make His priorities known to us as He provides for them. As mentioned in my previous post, I decided to get active on the blog again, starting with my last 2 weeks down here. You may find a trend in these posts. We’ll go through some great successes, typically followed by a few things that slow us down again. Just two weeks ago, our friend, Scott Payne, had finally fixed our F150 to get it running again for the first time in 18 months or so. 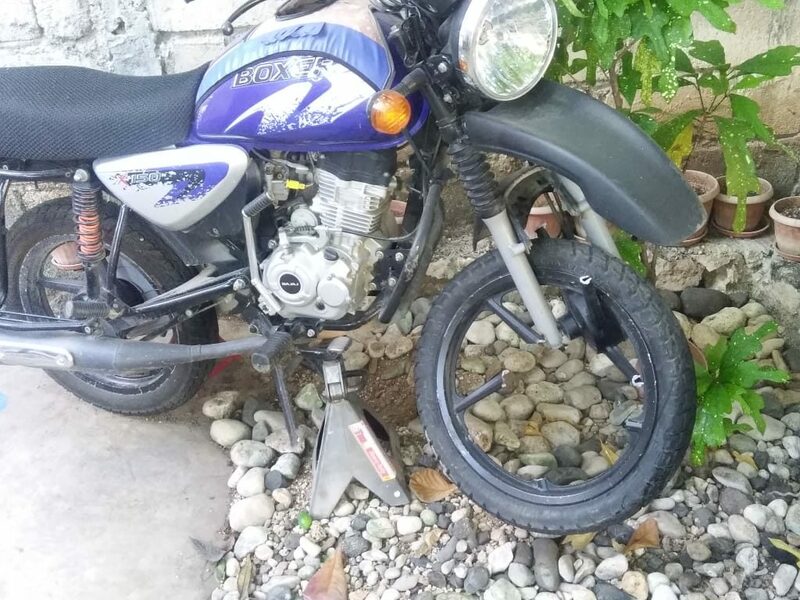 Unfortunately, one of Murphy’s laws here in Haiti is that when you do fix something, something else will inevitable break, especially with vehicles. So, just as we finished the installation at the Barbrey’s house, the big truck (Chevy) decided that it didn’t want to come home and we left it there for the night. On the 11th, we went over diagnosed it with 2 issues. First, a bad connection between wires and the battery was causing the truck to either turn off, or just not start at all. Second, a bearing went bad on one of the tensioning pulleys near (not on) the alternator. 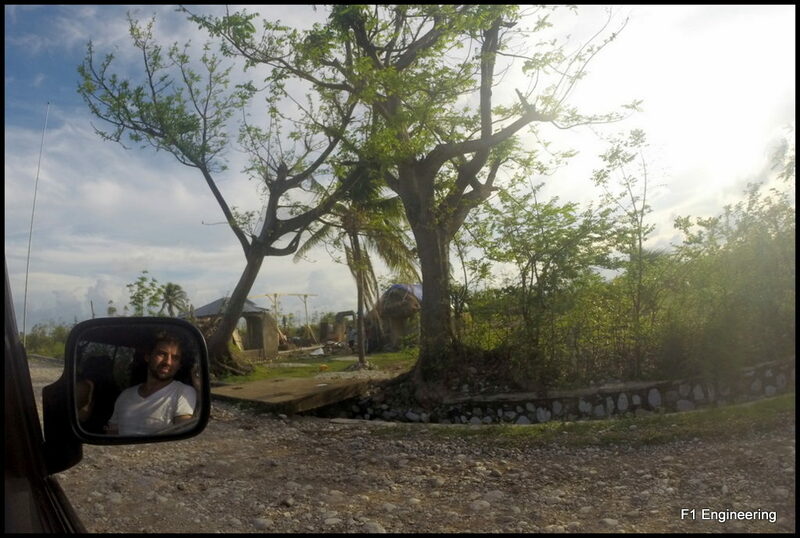 Thankfully, both things were easy to remedy here in Jacmel, and by the afternoon the truck was running and on it’s way home to our house. A special thanks goes to Chase and Anderson for fixing the pulley because I had already promised Jamie that I would spend this day helping her prepare the house for upcoming guests. However, while the truck was coming home, the front brakes started squealing, so we decided to change them. Unforunately, these pads are not locally available. Thankfully, the Kontsas family was able to bring them in for us on the 19th. For down here, a week and a half is a wonderful turn around time for a car repair, so we were quite happy. In the mean time, we were able to use the little truck for the work that needed done for the rest of the week. All that said, we have to give God some praise for the vehicles we have. This big truck, despite these latest difficulties, has been an absolute workhorse for 7 years. That is actually incredible given the terrain we have crossed and the work we have done. I’ve learned how to change most of the brake system, the water pump, and most of the steering system on that car, and it still runs. It looks like it’s from Mad Max these days, but we may even get some new doors soon (with functional windows). All of this from a truck that I bought back when I really had no idea what the mission was that God was calling me to. He knew, and He provided a fantastic vehicle for us. I know this post may seem random, but I figured that I should let you actually see a bit into our lives down heres to understand what God has called us to, and how it plays out. Thank you for your support. Please keep praying for us and supporting however God leads. The last 2 weeks have been pretty exciting down here. I will try to put up several posts in the next few days, but here is the start of that. Back on Monday, the 8th, our crew was able to assist our dear friends, Chase and Kimmey Barbrey (and PE) by putting up solar panels on their house. This meant a lot to me because they have quickly become close friends down here. Chase and I both love making things, and PE is only 6 months younger than Mara, so we look forward to having them grow up together. We thank God for moving them here, as we have prayed for a while for some close friends and they have been an answer to that prayer. 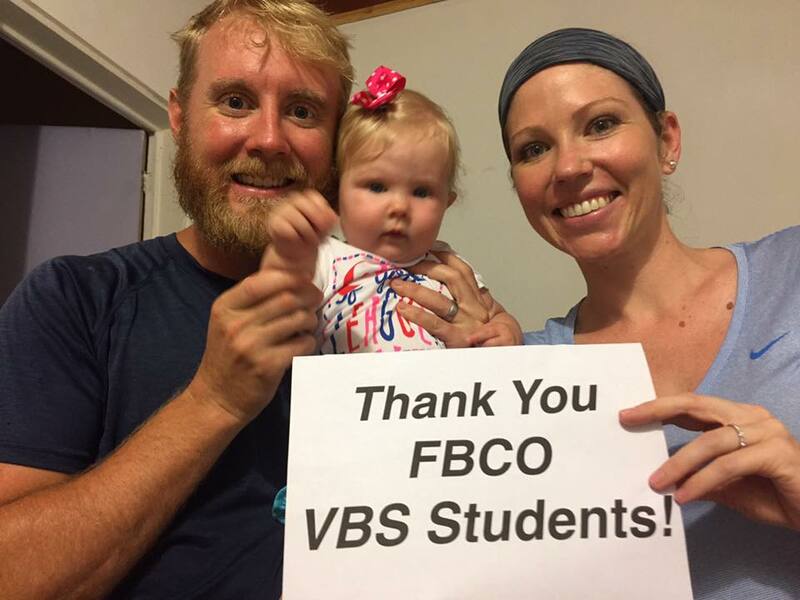 Chase, PE, and Kimmey Barbrey thanking the FBCO students who helped fund their solar installation. 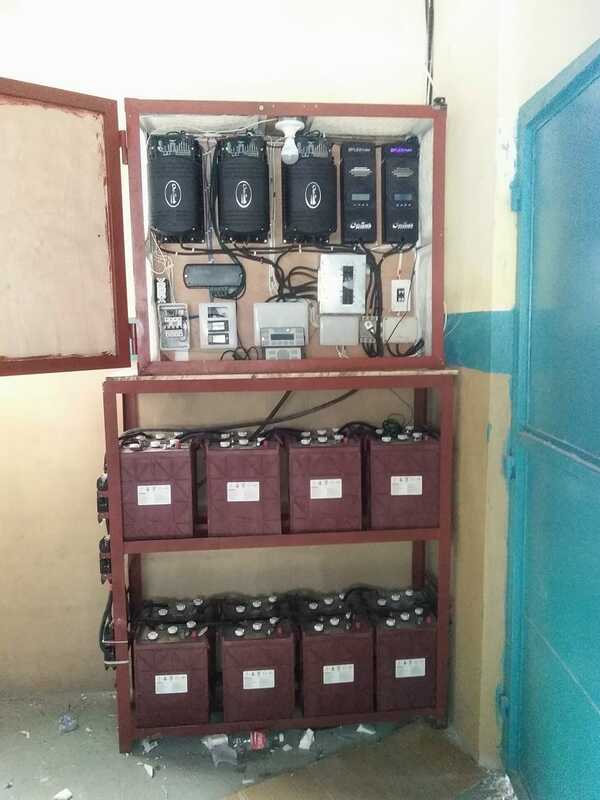 I want to thank all of you reading this for your support of F1 Engineering, that we can help awesome missionaries like that Barbreys save money and live better by having access to power. And thank you for supporting us as we train our crew down here. Recently, Gayly and Waly have officially taken over at the foremen, and I have stepped back into a supervisory role and let them do most of the work. While there are still little bits to fix when inspection time comes, they are learning quite well and can successfully install a system without me. It is very encouraging to see. Gayly wiring up the panels. Chase, Mara, and PE having a tea party. It’s now been a few days since returning home from Haiti. I have honestly been trying to process through in my mind what we experienced this past week. Heartache. Devastation. Turmoil. Loss. Hope. I have worked in Louisiana after Katrina, Alabama and Arkansas after tornadoes, West Virginia and Kentucky after ice storms. I have also served and gone on many mission trips before this, including one to Haiti after the earthquake. Nothing though, could have prepared me for our venture to the Savannette. Houses completely obliterated, to where families are living on a pile of dirt mixed together with busted concrete. Exposed rebar everywhere from where it had been torn apart. Seeing a family crawl out from under a piece of sheet metal they were using as a shelter. And yet, hope… This, is what I take away from a week of being there. Emotions can’t describe it. My heart and life have been changed. Today was a good day… Exhausting? Naturally. Full of “Haiti” extras? As expected. Overwhelming? Not surprisingly. Blessed? Most definitely, without a doubt, YES. Our first, full day in Savannette with the team from Johnstown (made up of my brother Josh, Sean McCool, Jeremy Barclay and Matt Trent) got off to a good start. The chainsaw crew, headed by Josh and Waly are doing a fantastic job, and Gayly has been great overseeing the teams clearing big trees around the area. 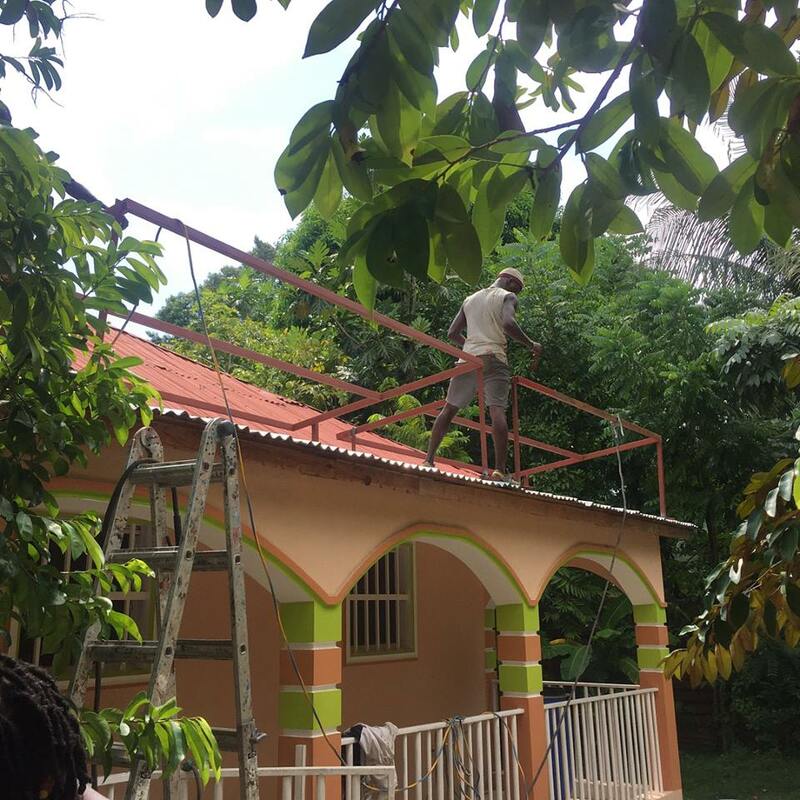 This week we’ve also had two men from the church in Jacmel, sent by Pastor Pierre, join our usual gang, which has been a wonderful addition as they’ve been taking time ministering to the people in this community. Yesterday afternoon, as we went around distributing tarps, I lost count of how many times we prayed with people as we actually took some time to stop and talk with each of them. 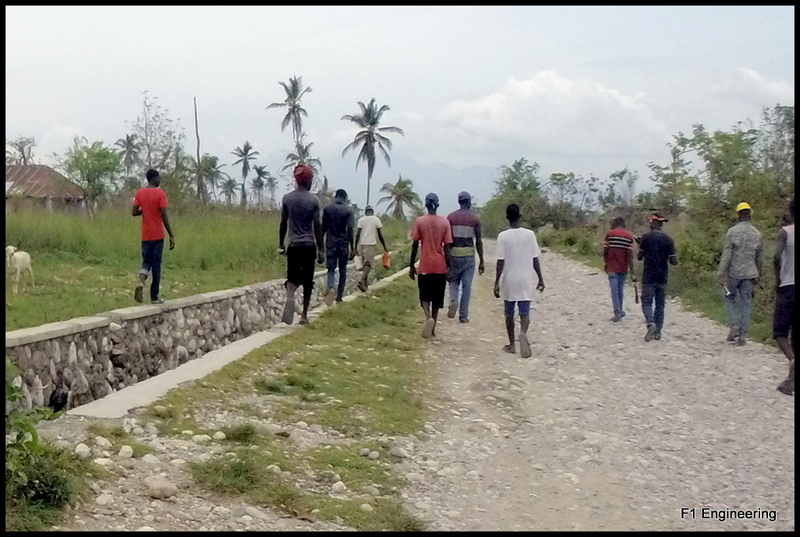 Three of the local guys we had hired for the machete crew had kept asking us to come and see their community and the damage done to their houses there, so finally this afternoon Sean, Anderson and I agreed to take a walk with them. They took us down a small road and soon we were coming across houses that we hadn’t seen before. Broken houses. More homes without roofs and families in need of help. All in all we saw about 20 houses (though there were many more), and even stopped to measure seven of them, but eventually had to draw a line somewhere. I admitted to the people that I felt heavy, because I could see so much need around me, and yet there was only so much that I could do to help and I didn’t want to promise them anything I couldn’t deliver…and incredibly, they understood. To be honest, most of them looked genuinely surprised to see strangers showing up in their zone in the first place, and completely unaware that anyone had even been trying to help in that area. Now, from the beginning, I had defined a specific region on the Savannette stretch (from the intersection in the north to the church on the south) to focus on, but hadn’t quite realized that the whole area I saw tonight for the first time ever, was still in that zone. Most of the 100 houses we had surveyed a couple weeks ago, you can see from the main road. And now I was finally becoming aware of the fact that if you head either east or west of that big road, there are so many more houses unseen, and thus far, unreached. 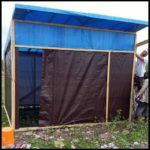 And I feel bad, because there’s even some elderly people who need tarps that are right outside the borders of this zone, but we just can’t stretch the perimeter right now until I know there’s more tarps to give. That said, I will admit that I did give away one tarp outside of that zone today…. A man on a motorcycle stopped to talk to me on the road this afternoon. He was coming from higher up the mountain, to the north, and had been heading to town when he spotted us. As he was talking to us, part of me kept wanting to say, “I’m sorry, but you’re outside of our zone. We can’t help you right now. You’re outside the zone,” but as he shared about having twin babies that were being rained on, I thought, “We have to check in on this.” So I called Paul, one of the local men in the area to check the man’s story for me. Turns out that this man lived over half an hour up the mountain. As Paul said “from way up there”, and there was no time to go investigating as it was already late afternoon. Sean and I looked at each other and agreed…maybe this man was just telling us a story, or perhaps he really does have twin babies waiting for him at home. Either way, the thought of them being exposed to the open sky was enough to give him the benefit of any doubts in our minds, and so we sent him on his way with a tarp in hand. And at the end of the day, despite the ups and downs in between, I choose to lift my eyes off the temporary struggles and remember those two men whose lives were eternally changed today. And tomorrow, we’ll continue to do what we can, with what we have, where God has placed us, trusting that He will supply our needs.